Mention Estée Lauder Youth Dew, and a chorus of “my grandma wore that!” arises. 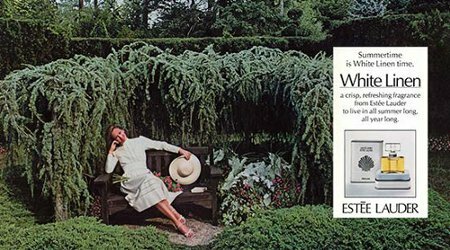 Estée Lauder White Linen might get a similar response, but this time about mothers, especially if those mothers joined the PTA, kept a tidy garden, and knew how to spray-starch a shirt. At one time, it seemed like every shopping mall exuded White Linen. Now, you rarely smell it, except maybe when you lean in to kiss Aunt Phyllis on the cheek. Sophia Grojsman (the nose behind Estée Lauder Beautiful and Spellbound, Lancôme Trésor and Yves Saint Laurent Paris, among others) developed White Linen, and it launched in 1978. According to the Estée Lauder website, its notes include Bulgarian rose, jasmine, muguet, violet, orris, vetiver, moss and amber. All you need is a quick sniff to add aldehydes and clean musk to that list. 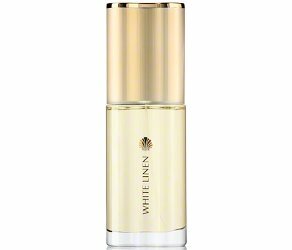 White Linen is a green floral fragrance with an almost audible whoosh of citrusy aldehydes to kick it off. Riding that whoosh is orange blossom, lily of the valley and green rose that smells like a heap of fresh laundry with the steam iron working overtime and a window open to the garden. Soon, the heart sweetens and turns slightly fruity, like firm peaches and purple flowers. Clean musk keeps it crisp and soapy. As White Linen settles, it sweetens further but not enough to call it sugary. It fades away on my skin after four hours, smelling like I’ve washed with a green perfumey soap kept on a cedar holder. White Linen’s birthday falls between the eras of racy green chypres and whopper orientals. It makes sense, if you think about it. White Linen’s green floral heart and moss-fluffed body hint at the elegant, disco-bound women who wore Yves Saint Laurent Rive Gauche and Rochas Mystère so well, except that Estée Lauder scrubbed it with soap and added some friendly sweetness to prep it for life in the suburbs. Where White Linen presages the 1980s is in its fearlessness. A dose of aldehydes wicked enough to make your eyes water? No problem. Attitude to burn? Yep — even if that attitude is more about stationwagons than stilettos. Seasoned perfume lovers probably already know White Linen well, but if it’s been a while since you’ve smelled it, get to an Estée Lauder counter and give it a sniff. It’s been 40 years since White Linen was released. Who knows? You might catch a hint of something subversive about that oh-so-clean veneer. After all, do you really know what Aunt Phyllis does in the afternoon? Estée Lauder White Linen is available at most department stores in a variety of formulations: Eau de Parfum, 60 ml ($67) and 90 ml ($75); perfumed body cream, 6.7 ounces, $50; and body powder, $52. Estée would have smiled at that, I bet! White Linen plus ballet in early spring sounds perfect. Who knew that ballet and White Linen were a natural combo? I wore that for years – as a very young woman, rather than as an Aunt Phyllis. I never think of it as “suburban mom” because my memory of it is “young woman on a sunny day.” One of the joys of fragrance is that we can all interpret it in so many different ways. Same here…I wore it as a teenager and never thought of it as a mature woman smell…. I bet it brings back nice memories! It’s hard for me to picture a teenager today wearing it, though. True about teens today. But I wore WL in high school! All through hs, I worked in large dept stores. So I was able to try (and fall in love with) everything. ???? Oh goodness Angela I am sure my teenage daughters would recoil were they to smell White Linen..it’s so funny how taste in perfume has changed over the years! That would have been my guess! I wore it in high school! ???? In theory, I could be a grandmom by now. But thankfully, I am not. ???? I adored WL back in the late 70s! Went through several bottles as it was perfect for Texas summers. Funny, but just last week I saw a tester at Ulta and tried it. I knew it would be different but wasn’t prepared for the ghost of White Linen. It actually made me sad. ???? Oh, that’s too bad! I bet vintage White Linen doesn’t hold up that well, either, so it’s probably the new stuff or nothing. I was just fine with my new sample, but I wasn’t super familiar with it back in the day. That’s too bad! Here I’d thought EL was one of the companies who quietly held up its standards. Oh, that’s sad! No opportunity for me to recapture my youth via White Linen, then. Maybe! Really, it’s worth a try. I’m sure it still has the same signature, even if it’s not exactly the same completely. Great review, Angela! I will give it a sniff next time I see it in the wild. I also wore White Linen Breeze when it first came out…to the best of my recollection it was a bit lighter, brighter and tamer…. It’s always interesting to see how something smells now when it used to be so familiar. White Linen is a classic! White Linen Breeze is on my list of top ten favourite perfumes of all time. I miss it! Pure White Linen Light Breeze was good but not the same fragrance. I wore White Linen on my first trip to Paris. During my next four trips, I was an employee of a major French perfume house, so I no longer wore an American fragrance. I bet White Linen brings back lots of memories, though! Scent and special memories can lock together so firmly. I know what this Aunt Phyllis (me) does in the afternoon (works) and I have never worn nor owned White Linen in all my long year of perfume collecting. Hmm. Maybe it’s time for some White Linen? And an afternoon adventure? I bet we could come up with something to drag you out of the office…. This is still by far one of my fave Estée classics. This and Pleasure, I wore through my teens and in my 20’s…then I went on to niche perfumes. I love the idea of a teen sampling though her mom’s bottles! And, clearly, lots more young women wear White Linen than I’d thought. The same with No5..I have smelled it on serval girls the last 6 months. The youngest was 19! Well, this is hopeful news for future perfumes! Was it No 5 or one of the recast versions (Eau Premiere or L’Eau)? Those are some sophisticated young ladies either way! That’s what girls did where I went to school. It made us feel sophisticated to wear out mother’s perfumes. Now teens would probably be horrified to wear their parent’s scents. ???? I’m so out of touch with today’s teens that I’d better not comment, except to say that I’d guess you’re right! I was just reading Turin’s review of Pleasures, where he mentions the struggle of perfume versus soap. White Linen’s rose is too good, and what a treat! It seems like you could wear it *because* of the lovely memories of the family friend! Maybe not all the time, but a little bit now and then. The opening of White Linen has always smelled like starched shirts (I love your “steam iron” description – perfect) and hairspray to me. I’m not wild about that phase and have never really smelled past it, as it were. I sprayed a bit on after reading this, and the development is exactly as you describe. Gorgeous! Thanks for walking me through and introducing me to a fragrance I own but have never quite understood. It’ll get a lot more wear in the future. Sometimes I love reading reviews of a fragrance I own, because it can help me delve that much more deeply into it. And, yes, steam iron and hairspray isn’t a bad description! My mid-40s Mum did wear this in the late 70s/early 80s but so did a sophisticated 20 year-old art school friend. It worked for both of them and I would gladly spritz it on from time to time. It was actually released with two other fragrances as a trio to wear together. Those scents were called Pavilion and Celadon and are no longer made. I have smelled WL recently and it is recognizable unlike most of the other EL fragrances of that era mentioned in other comments that are still available in rather generic bottles. At least WL is still in the same style of bottle as it was in the past. I think it would smell great on a guy… that freshly steam ironed quality not unlike Penhaligon’s Sartorial, which I’d wear in a minute! I also wish Aliage was still available as it once was… Green, dry and gorgeous. Nice to hear that teenagers are investigating the classics. I would too given all that pink dreck marketed to them! Aliage is so wonderful! I have an old bottle somewhere that you’re reminding me I need to wear in amplitude this spring before it goes off. Other fragrances that hint at White Linen (to me, anyway) are Narciso Essence, Liz Taylor White Diamonds (really! ), and Caron Nocturnes. Oh you’re very lucky! Another scent I had back then was Shiseido Inoui which was similar to Aliage. Ring any bells with you? Of the other fragrances you mentioned Nocturnes was another 80’s favourite of mine. I have a pretty full bottle (black cap and embossed flower on the bottle) which is probably 10-15+ years old and still smells great. When I wear it I’m reminded a bit of the original D&G for women (aka Red Cap!) another aldehyde. I’ll have to sample the other two you mentioned! Speaking of Caron, I loved Eau de Caron and had the original tall rectangular bottle with the glass stopper. I would love to smell that again! I do remember Inoui! I had a bottle, but passed it along a few years ago. The Red Cap D&G has tons of fans, and now I’d love to test it against Nocturnes, since I don’t think of them as sister fragrances, but you never know! I still have vintage Nocturnes which comes off as smooth creamy buttery florals on my skin (so I can’t compare it to White Linen but I see how it could be as it is an aldyhyde floral as well) but I also owned that D & G with the red cap…my favorite tagetes (marigold) perfume…such a shame it was discontinued…. I’m surprised they discontinued that one. It seemed so popular, and people still talk about it! The original Fendi suffered the same fate. It was so well liked – every time I wore it I think that likely prompted the purchase of a bottle – people always asked what it was! The original Fendi was also really lovely. Sad they aren’t still making both of them. Thank you for reminding me of Aliage! I wore that one as well in the late 70s early 80s…sad to hear it did not survive reformulation. It was a good one, so easy to wear. Love Aliage and Givenchy III! Hard to get both. I agree–I adore both of them! I adore White Linen which to me is mostly about aldehydes and rose. And she created my ultimate favourite fragrance ever, YSL Paris, so count me in as one of her fans. Thanks for reviewing this, it’s not mentioned a lot these days. Sophia Grojsman is pretty amazing, I agree. White Linen was my signature during my early twenties. Back then, I thought it was very elegant compared to some of the heavy hitters of the day. By comparison, it really was a youthful scent for that time. I’ve been afraid to revisit the current version so thanks for the review. Chanel No 22 feels similar to my scent memory of WL. No. 22 certainly packs White Linen’s aldehydes, but for me its incense sets it apart from White Linen’s soapy-starchy green rose. They’re sisters, though! EL fragrances seem to be dissappearing from the shelves in my part of the world (Europe). None left at Douglas, and I picked up Knowing on sale at airport duty-free, they also seem to be pulling the line. I find that sad, because EL at least tries to make an effort and keep the heritage, low seller fragrances in their assortment, even if reformulated and in streamlined bottles. That’s one thing I always admired about Estée Lauder too–I felt like they were holding to their standards, and at a reasonable price.